The number of improvements that Alabama Extension at Auburn University SNAP-Ed supported in FY17 will ensure that Alabama residents can live well in their communities. SNAP-Ed facilitated local and state policy changes, systems changes, environmental improvements, and promotional efforts to make it easier for individuals with limited resources to choose healthy foods, healthy beverages, and physically active lifestyles. In FY17, 33 SNAP-Ed educators fostered almost 300 improvements in 49 counties reaching more than 22,000 residents throughout Alabama by collaborating with local, state, and national leaders and stakeholders. SNAP-Ed efforts in Alabama continue to grow and overlap. The pockets of healthy change will eventually cover the state leading to a culture shift. Our state is known as Alabama the Beautiful for a reason. Alabama has a remarkably diverse landscape from sun-drenched shores to forested coves and mountains. SNAP-Ed educators partnered with numerous parks and trails in FY17 to make exploring the great outdoors even more exciting. Environmental improvements enhanced physical activity facilities. Promotional efforts advertised physical activity opportunities. Alabama shoppers have an easier time choosing healthy items because of the support SNAP-Ed educators provided to 11 stores. 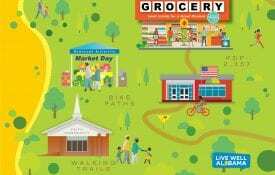 Local champions, or owners/managers, of grocery stores, convenience stores, and school stores made 36 improvements reaching almost 8,000 residents each day. Systems changes improved buying practices to increase inventory of healthy foods and beverages. Environmental improvements increased shelf space and improved placement of healthy foods and beverages, and, in partnership with the CDC ALProHealth, improved facilities for stocking healthy items. Promotional efforts in food retail provided recipe demonstrations, tastings, and signage and expanded the Good Choice initiative, a partnership with the Alabama Department of Public Health and SNAP-Ed. The contents of Alabama’s shopping carts look healthier because SNAP-Ed helps food retailers improve choices in stores. Alabama youth and adults are taking control of what shows up on their lunch menus and dinner plates by growing their own fruits and vegetables. SNAP-Ed educators supported establishment, reinvigoration, or sustainability of 27 school and community gardens making fresh fruits and vegetables available to more than 4,000 Alabama residents. Systems changes meant processes at food pantries, hospitals, and schools were adjusted to allow acceptance of fresh, local produce from gardens. Environmental improvements enhanced row-based, raised bed, hoop house, and container gardening practices. Small tools and other supplies were also provided. Promotional efforts provided recipe demonstrations, tastings, and informative materials to encourage use of fresh fruits and vegetables grown in the gardens. Eating vegetables has never been easier. Alabamians can now pick their dinner from community gardens. Policy changes improved days and hours of operation to make farmers markets more convenient for local residents. Systems changes expanded public transportation routes to farmers markets, began a coupon initiative, and promoted acceptance of SNAP EBT payment for produce. Environmental improvements supported facility upgrades through partnership with CDC ALProHealth. Promotional efforts provided recipe demonstrations, tastings, and signage. Demand for fresh fruits and vegetables from Alabama farmers is reaching new heights. With the help of SNAP-Ed, more than 35 emergency food assistance sites combat hunger with healthy foods. Through partnerships with local champions, more than 3,250 residents received healthy foods during times of need. Policy changes improved serving times for summer meals to increase participation in summer feeding programs. Systems changes expanded public transportation routes to food pantries, adjusted donation rules at food pantries to allow and encourage fresh produce, and adjusted donation rules with backpack programs to encourage healthy foods. Environmental improvements increased shelf space for healthy foods and beverages; established, reinvigorated, or sustained edible gardens to increase availability of fresh produce at food pantries; and, in partnership with CDC ALProHealth, improved facilities for stocking fresh produce. Promotional efforts provided recipe demonstrations, tastings, and distribution prompts. 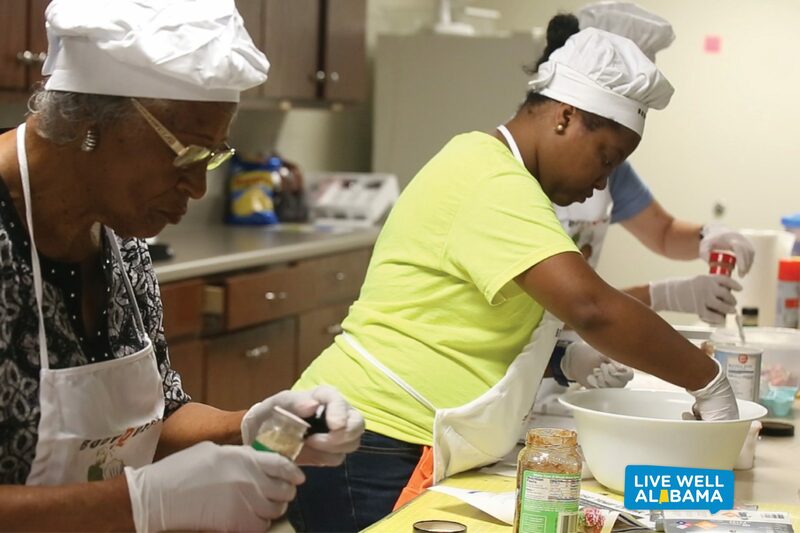 Live Well Alabama recipes created a demand for vegetables at Alabama food pantries. SNAP-Ed educators launched a new initiative in FY17 in partnership with seven Alabama faith communities serving almost 850 members. Live Well Faith Communities provides a nine-lesson direct education series on healthy eating and active living and supports the faith community for at least one year in implementing positive changes that make living well easier. Systems changes promoted availability of a healthy option for each element of a congregational meal—entrée, sides, dessert, and beverage. Promotional efforts encouraged healthy selections at congregational meals and provided recipe demonstrations, tastings, and informational materials to faith community members. Positive nutrition and physical activity changes happen daily through grassroots efforts at faith communities influenced by SNAP-Ed.